A good professional photographer will tell you that it’s not the camera that created a terrific image but the photographer who knows just how and when to use it. In the film days we all referred to a camera as nothing more than a box. If we gave praise to our equipment, then it was our arsenal of lenses that received the spotlight. As important as our knowledge and use of creative lighting is (see my previous article on photographic light) our selection of photographic lenses play a tremendous role in the outcome of an image. Many photographers have argued that the glass in front of the camera (or box) is the most important consideration when assessing one’s gear. In the past two decades I have amassed quite the collection of camera bodies, lenses, lights, and accessories and yet I never considered myself a gear-head. When my work was done I put down my tools until the next assignment, not really making much of a fuss about my equipment. Then technology got a hold of photography in about every way imaginable. We said goodbye to film, traditional labs and darkrooms (sadly) and said hello to computers, both in our cameras and on our desktops. Technology, in my opinion, has re-engineered photography so much so that I believe our choices in cameras is just as crucial as in our choices of lenses. Here in North America the debate rages on which is better, Nikon or Canon. Rather than fall into this endless argument, I’d prefer to share my experiences with the gear I use and depend on. Setting aside all my lighting and commercial equipment, my list of Nikon Pro gear is as follows: D4 bodies, 300mm 2.8 vr, 70-200 vrll, 24-70 2.8, 50 mm 1.4, 60mm 2.8, 85mm 1.8, 16mm fish, 20 mm 2.8, and a pair of sb900’s. The D4 has really brought Nikon to the forefront of modern photography with its combination of great tonal range, ISO range, and accuracy. I really don’t sweat tough situations, even when a client has demanded that I “work my magic” in lightless conditions with only moments to prove my worth. I’m not sure if its just television or a social media or a combination of both that has given birth to this popular perception that everything imaginable is just a click away, but I don’t sweat it, I just grab my D4. At Exposé Studios we still believe that image quality must translate from screen to print without any loss of impact. If an image only looks decent on screen then what’s the point, that’s our view. The D4 allows us to maintain this strict principal with an ISO range second to none. I’ve shot images at ISO3200 and higher to stay in the moment, keep with the vision of my client, and sometimes just for fun. I have then made large format prints from these images of terrific quality. The D4’s white balance and tonal range hit the mark every time leaving me with the confidence that this is the best DSLR for me. Your client stands before you ready to go with that look, what? I guess they’re not as fussy about where their photos are taken as we as photographers would like them to be. So you have a wall, some sort of aluminum window frame, and your client standing there and you’re not sure how to make this interesting. Well, grab a Nikkor 300 mm 2.8 and slap it onto your D4 and let your gear earns its keep. The 300mm places the attention right where it belongs, on your client, rendering everything else around them as insignificant. Now you can explore the subtleties of your client’s face and create an image even they didn’t expect in a less than a forgiving setting. Each of my other Nikon lenses possesses the same potential of capturing incredible clarity and quality of light and shape, thus allowing me to be creative and confident with my work. 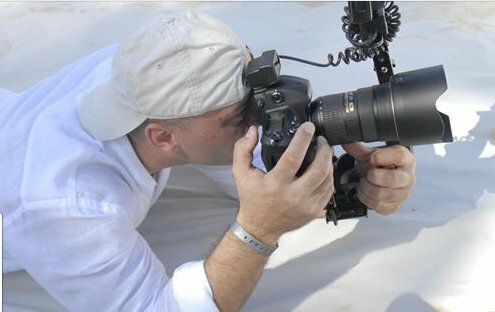 I have employed many photographers over the years without questioning their choice of equipment. I can honestly say that those shooters who weren’t Nikon users were definitely at a disadvantage. Although their creativity was there accompanied by their desire to produce, many moments were lost due to gear that just couldn’t keep up. Issues such as focus drift, poor TTL exposure, uncorrectable colour cast, and uncontrollable shadow noise could most likely have been avoided if they had shot with the current professional Nikon equipment. At the end of the day, wouldn’t you say its better to shoot what you feel creatively and move on, rather than being forced to overshoot just to make up for the images your equipment couldn’t handle.